Just over two weeks ago Labour were talking up a Ministry of Social Development report that showed the gap between rich and poor is shrinking (what else would you expect when more attention is paid to dividing up the pie than growing it?) Trevor Mallard turned up at a meeting waving a chart from said report and Ruth Dyson waxed lyrical. This week a further report has been released which contains some good news but plenty of not so good. The media seem to have missed it. Perhaps Simon Collins is away. The teenage birth rate for Maori fell by 26 percent between 1997 and 2002 before increasing by a similar amount between 2002 and 2007. Just over half of all women who have children in their teens are Maori. Young Mäori are also over-represented in youth justice statistics, accounting for almost half of all police apprehensions of 14–16 year olds and over half of all cases proved in the Youth Court involving 14–16 year olds. Road deaths for Mäori under the age of 25 increased between 2001 and 2005. By comparison with the total population under 25 years, young Mäori are at greater risk of dying from assault, unintentional injury and motor vehicle accidents. The Maori youth suicide rate which, after falling between the periods 1996–1998 and 1999–2001, increased by nearly as much in the years up to 2003–2005. Maori secondary school students were almost 4 times more likely to witness adult violence in the home than NZ European. I do not need to spell out the implications of all the above. There is a group of young Maori who are living under-achieving, unproductive and often unhappy lives. The group out of which most crime emanates is growing. While the Prime Minister was speaking to Grey Power yesterday in Lower Hutt, the Hutt South candidates were speaking to Grey Power over the hill in Wainuiomata, including Trevor who (I suspect) had the meeting moved forward half an hour so he could dash off the be with the PM later. Wainui is Trevor's home and he pulls the strings. The format was strange with each candidate getting 3 mins to speak followed by 5 mins of audience questions just to them. I got grilled on climate change, gst and the economy by local Grey Power hierarchy. That's OK. I like criticism. Stirs the blood. The United Future candidate from Rimutaka remarked to me they were particularly hard on me but that I'd handled it well. And the feedback after the show, as I handed out the 20 Point Plans, was encouraging, especially from men who are climate change agnostics and others worried about the economic effects of the ETS. The hot button issue for this group seemed to be crime, with a number calling for the return of the death penalty. Unfortunately I didn't get chance to get involved in that discussion but Maori Party candidate, Derek Fox, asked the woman calling for it if she would flick the switch and she replied gladly. Then she made a strange remark. Even if we never used it we should bring it back, indicating she thought it would be a successful deterrent. Has she looked at the crime in those US states that still use it? Another man said he didn't think we should be paying to keep people in prison and we should just 'trash' them. Emotive, unreasoning stuff. For ACT this election is primarily about the economy. Say ‘economy’ to some people and their eyes glaze over. They shouldn’t because the economy has a huge effect on all our lives regardless of our age. Our average income from working in New Zealand is now NZ$450 behind Australia’s. NZ$450 per week. ACT has a plan to bridge that gap over the next ten years and we have laid it down here. Please read it. What would bridging that gap mean for you? For a start Super would go up because Super is indexed to average after-tax earnings. Cutting income tax would also have a similar, more immediate but smaller effect. Instead of waiting for a slightly bigger slice of the cake that may or may not come your way, the chances of your super income rising are much greater with strong economic growth. But it isn’t just about the money going into your bank account every week. It’s about far more. A number, possibly even a majority of you have children and grandchildren now living overseas. That is because NZ is slipping in international competitiveness. Our people leave for better incomes, sometimes as a short-term measure to repay a loan sooner. Many do not return. And that is an enormous emotional cost to their families. We are also seeing the effects of losing international economic competitiveness in skill shortages in the health area. Most health care is consumed in our older years. By 2050, the portion of the population that is 65 plus, is going to double. If we carry on letting NZ drop down the OECD income ladder – we used to be third and are now 22nd – our ability to care for the aged will get far worse than it is today. National will win this election, but because they have bought into Labour’s major economic policies, have little hope of achieving the economic growth we so desperately need. If you believe the economy matters you need to give your Party Vote to ACT so more MPs can join Rodney Hide, who is going to win Epsom, in achieving a real change of direction for this country and the people who live in it. Last night a friend and I attended a Maori Party hui in Lower Hutt. The candidate for Te Tai Tonga was launched - a youngish lawyer who has a pleasant way about her but waffles a fair bit - and Derek Fox, Te Ururoa Flavell and Pita Sharples all spoke. Tariana was a no-show but I wasn't disappointed. The Maori Party is seeking the electorate vote only. That was the first message. Seven candidates in the Maori seats seeking only the electorate vote. But then that changed as the meeting went on and they began explaining the MMP system quite extensively (including an innovative slide show presentation) and decided they were trying to grow their Party Vote in the general electorates as a basis for future growth. This seeming switch may come about because they speak to two different audiences at once. The handful of Ngati Pakeha present may have been noted. The Maori Party take a long term view. The past three years has been all about building credibility and they are very proud of having spoken to every bill that has passed (and so they should be), their conduct in the house (and so they should be) and their expanding array of policy positions. So the method is very much emotion-based. The tribal identification is subsumed by the new tribe - the Maori Party. The Flags, the Identity, the Family, the Celebration. The vibe is a good one. There is humour aplenty. They are a young party despite having older MPs (Pita can't wait for someone younger to come along and replace him) and brimming with enthusiasm. It would be very easy to be seduced by the newest political gang, especially when one sympathises with their big issue - trying to hold on to their property rights (which goes beyond just the seabed and foreshore legislation). But I do not see separatism as good for New Zealand. Factionalism of the fighting-over-resources kind is anathema, it is a divisive and destructive feature of socialism. Although the mood was very upbeat the overriding message is still one of Maori difference and Maori need and from what I could discern the really tough issues never got a look in. Clark says this election is about 'trust'. What about trusting the people? Never before has a government demonstrated less trust in people to run their own affairs. If it's about trust, Labour must be the last choice. We do not need a ban on gangs. A good deal of what gangs do is illegal (thanks, in the main, to drug prohibition). The police cannot control their criminal activities so their best response is to ban presently legal and overt activities - freedom of movement and association. "We don't like coming second to Australia in anything, but if there was a Bledisloe Cup for anti-gang laws, they would clean up," Mr O'Connor said. Gangs will always exist. They are a facet of the human impulse to group for mutual advantage. Prohibition provides some of them with a more than lucrative means of support (welfare provides them with a less than lucrative means). If we want rid of the resulting criminal gangs then we have to destroy their revenue source on both counts. Ask yourself, are gangs selling home-brewed wine and beer? Why not? The volunteers who deliver election material frequently ask about which letterboxes they should put material in. I put it in all letterboxes. Took the boy and the dog and we covered Lowry Bay yesterday. Even got a bit sunburned. Beautiful day. I know the caregivers in one of the foster homes this young man lived in and they are very good people. Apparently they have stood by him and supported him during the trial. I don't much care what happens to this young murderer. The caregivers would be appalled to hear me say that no doubt. But comes a point when forgiveness is no longer an option. Maybe they still haven't and won't ever reach it. What I do care about is how hurt and betrayed they must be feeling. Helping people with hard backgrounds involves a huge amount of trust and you convince yourself - you have to - that it is warranted and flows both ways. With the vocation they have, the only way you keep at it is to accept, you win some, you lose some. What cost the loss though. He [Mike Doolan] says international experience shows that economic conditions are closely associated with levels of child abuse, and any group that suffers more from social and economic changes are found to be over represented in child abuse and other antisocial statistics. The effects of the economic reforms of the 1990s can be seen in the higher rate of child killings during that decade. The lower death rate between 2000 and 2005 can be partially attributed to low unemployment levels and much greater prosperity, he says. The problem with this theory is that journalists conveniently ignore statistics prior to the 90s. Do the 1990s stand out particularly? The rate of deaths does not anyway have a hard and fast correlation to the amount of abuse. And trying to measure abuse is even more troublesome. Definitions, awareness of, willingness to report, child justice approaches, have all changed. 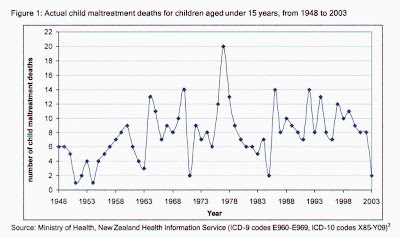 It would for example appear there was little Maori child abuse pre the 60s (statistically speaking). That is because Pakeha society largely ignored Maori society. Maori ex-nuptial rates of birth (which have a strong association with child abuse) were not even included in general statistics until the 1960s. Here's another thought. The medical fraternity is progressively more able to save life. How many more children are invalided through maltreatment who would previously have died? The child death figures are very small and consequently very volatile. I would be reluctant to use them to illustrate any theory, as unsatisfactory as I find that.